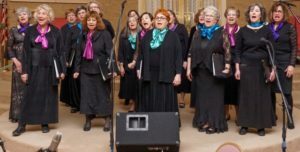 In 2013, the board of the Colorado Hebrew Chorale voted to launch a new endeavor: the formation of a women’s choir Kol Nashim (“Women’s Voice”). Kol Nashim was established in fall of 2013 by music director Leah Peer, and is united with the Colorado Hebrew Chorale in its mission to preserve, promote, and celebrate the Jewish experience through song by performing with and for diverse audiences, and its commitment to multicultural outreach, education, and Jewish communal involvement. Kol Nashim’s additional performance focus is to raise funds and awareness in support of charities which assist women in need. In May 2014, Kol Nashim performed its first benefit concert, “Woman to Woman”, on behalf of the Jerusalem Shelter for Battered Women. This concert, hosted by Congregation Rodef Shalom, attracted over 60 attendees and raised over $1,400 for the Shelter. In August 2014, the Colorado Hebrew Chorale board voted that the Jerusalem Shelter for Battered Women will be the designated recipient of the funds raised by Kol Nashim’s annual benefit concerts. In March 2017, Kol Nashim launched “Sing Out for SafeHouse!”, a collaborative choral event with other women’s choirs, benefitting SafeHouse Denver, Inc.
An anonymous donor now matches all funds raised by Kol Nashim on behalf of victims of domestic violence locally and in Israel. Qualified singers in all voice parts are welcome to contact Leah Peer for more information.